The sea sandwort is a flowering plant and grows on sandy or pebbly shores. It seems like a desert plant, and there are similarities. What can a desert plant not do without? Thick and waxy leaves and stems, the water reserve must be held somewhere, or a root system that would reach more than 10 metres deep down. The sea sandwort has both ... and in addition very regularly placed nice leaves. Lyme-grass is the helper of many other plants. 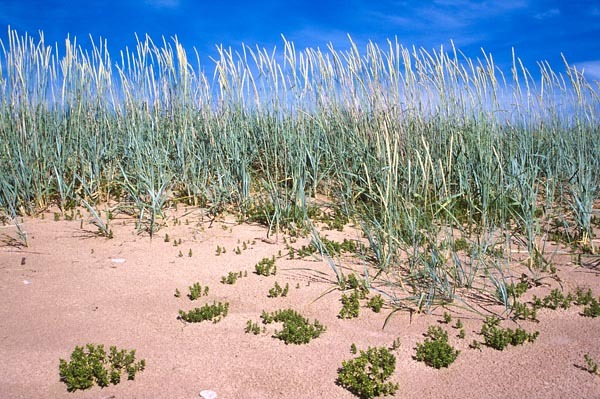 Its rhizomes prevent the dune sands from moving and prepare the ground for the growth of other plants. It is a classical dune grass representative, with a strong stem and stiff leaves covered with a bluish wax layer to prevent evaporation of valuable water.